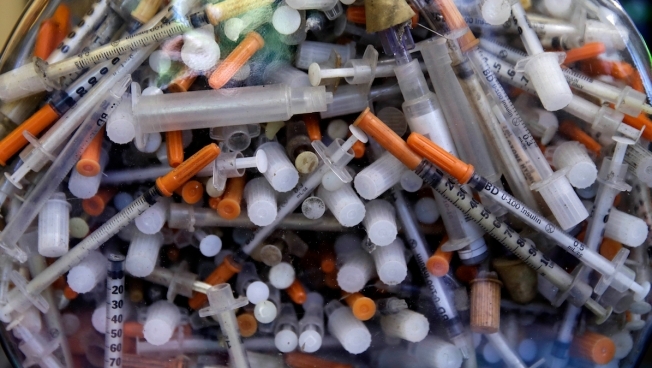 This Wednesday, June 7, 2017, file photo shows hypodermic needles that were recovered from the Merrimack River in 2016, at the Clean River Facility facility in Methuen, Mass. A government study released on Thursday, June 7, 2018, found that heroin addicts and other injection drug users were 16 times more likely than other people to develop the staph infection MRSA. With an increase in drug use, more people are contracting severe illnesses from MSRA. MSRA is particularly pervasive amongst those who inject drugs directly into the bloodstream. Health officials have tied MRSA to as many as 11,000 U.S. deaths a year. One type of superbug bacteria is increasingly spreading among people who inject drugs, according to a new government report.